Do you work in the middle of the CBD and sometimes struggle for lunch inspiration? 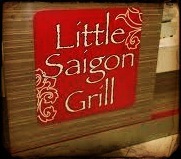 If you haven't before, take a trip down to Little Saigon Grill based in Rowes Arcade. This is one of my favourite places to go to in the city as it's quick, cheap, healthy (enough) and will surprise you with not only their variety but quality of food. I've been going here just under two years since I moved offices and (although others may have a different view) I can say that I have never had a reason to complain about their service or food. This Vietnamese take away has an extensive menu of mouth watering meals ranging from vermicelli noodles, vermicelli noodle rolls, curries, Pho (noodle soup bowls), salads and baguettes/bread rolls. My ultimate favourite is the vermicelli noodle salad with the satay chicken on top. The salad and noodles are fresh, the satay is creamy and the fish sauce tops it off to be a filling and tasty lunch. Add a drink on the side and you have a great tasting meal under $10 - something that isn't overly common in Brisbane anymore. I would also recommend their green chicken curry with rice, a small container is only $5.90 and it has just the right amount of spice to it or their vermicelli noodles rolls, ranging from $2, they serve it with a delicious peanut sauce that will make you want more. Cheap food, great service, yummy dishes and they have enough variety on their menu to keep you coming back for more – and I guarantee you will after your first visit.